In a previous post I described a generalisation of the Metropolis Hastings MCMC algorithm which uses unbiased Monte Carlo estimates of likelihood in the acceptance ratio, but is nevertheless exact, when considered as a pseudo-marginal approach to “exact approximate” MCMC. 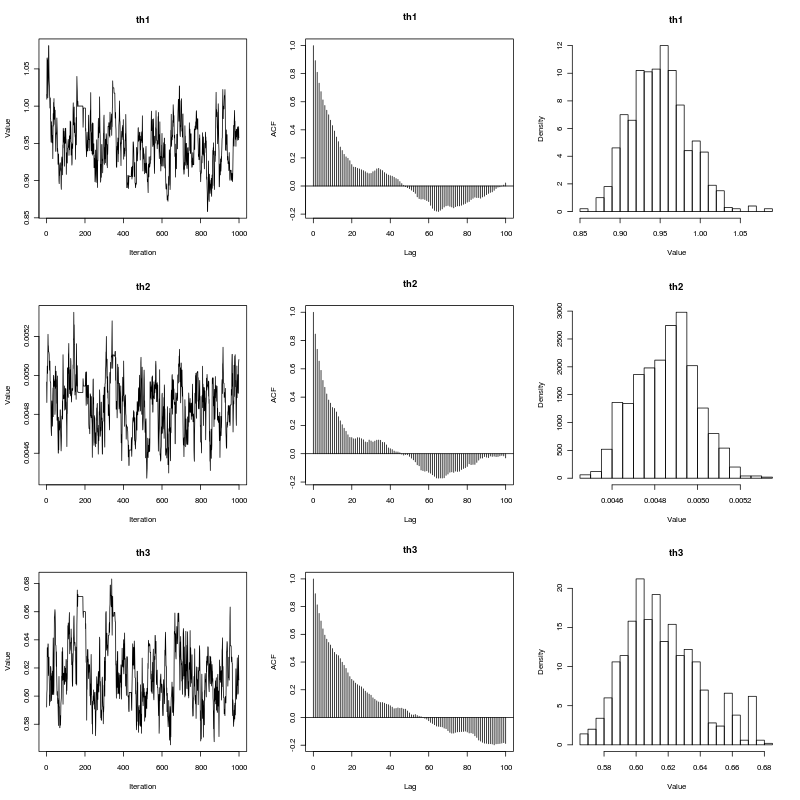 To be useful in the context of Bayesian inference, we need to be able to compute unbiased estimates of the (marginal) likelihood of the data given some proposed model parameters with any “latent variables” integrated out. This method is great provided that the (marginal) likelihood of the data is available to us analytically, but in many (most) interesting models it is not. However, in the previous post I explained why substituting in a Monte Carlo estimate will still lead to the exact posterior if the estimate is unbiased in the sense that . Consequently, sources of (cheap) unbiased Monte Carlo estimates of (marginal) likelihood are of potential interest in the development of exact MCMC algorithms. It is clear by the law of large numbers that this estimate will converge to as . That is, is a consistent estimate of . However, a moment’s thought reveals that this estimate is not only consistent, but also unbiased, since each term in the sum has expectation . This simple Monte Carlo estimate of likelihood can therefore be substituted into a Metropolis-Hastings acceptance ratio without affecting the (marginal) target distribution of the Markov chain. Note that this estimate of marginal likelihood is sometimes referred to as the Rao-Blackwellised estimate, due to its connection with the Rao-Blackwell theorem. where . The weights, , are known as importance weights. An idea closely related to that of importance sampling is that of importance resampling where importance weights are used to resample a sample in order to equalise the weights, often prior to a further round of weighting and resampling. The basic idea is to generate an approximate sample from a target density using values sampled from an auxiliary distribution , where we now supress any dependence of the distributions on model parameters, . 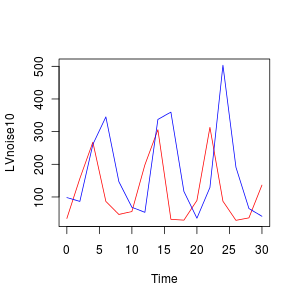 First generate a sample from and compute weights . Then compute normalised weights . Generate a new sample of size by sampling times with replacement from the original sample with the probability of choosing each value determined by its normalised weight. As an example, consider using a sample from the Cauchy distribution as an auxiliary distribution for approximately sampling standard normal random quantities. We can do this using a few lines of R as follows. Note that we don’t actually need to compute the normalised weights, as the sample function will do this for us. Note also that the average weight will be close to one. It should be clear that the expected value of the weights will be exactly 1 when both the target and auxiliary densities are correctly normalised. Also note that the procedure can be used when one or both of the densities are not correctly normalised, since the weights will be normalised prior to sampling anyway. Note that in this case the expected weight will be the (ratio of) normalising constant(s), and so looking at the average weight will give an estimate of the normalising constant. Note that the importance sampling procedure is approximate. Unlike a technique such as rejection sampling, which leads to samples having exactly the correct distribution, this is not the case here. Indeed, it is clear that in the case, the final sample will be exactly drawn from the auxiliary and not the target. The procedure is asymptotic, in that it improves as the sample size increases, tending to the exact target as . We can understand why importance resampling works by first considering the univariate case, using correctly normalised densities. Consider a very large number of particles, . The proportion of the auxiliary samples falling in a small interval will be , corresponding to roughly particles. The weight for each of those particles will be , and since the expected weight of a random particle is 1, the sum of all weights will be (roughly) , leading to normalised weights for the particles near of . The combined weight of all particles in is therefore . Clearly then, when we resample times we expect to select roughly particles from this interval. This corresponds to a proportion , corresponding to a density of in the final sample. Obviously the above argument is very informal, but can be tightened up into a reasonably rigorous proof for the 1d case without too much effort, and the multivariate extension is also reasonably clear. The bootstrap particle filter is an iterative method for carrying out Bayesian inference for dynamic state space (partially observed Markov process) models, sometimes also known as hidden Markov models (HMMs). Here, an unobserved Markov process, governed by a transition kernel is partially observed via some measurement model leading to data . The idea is to make inference for the hidden states given the data . The method is a very simple application of the importance resampling technique. At each time, , we assume that we have a (approximate) sample from and use importance resampling to generate an approximate sample from . More precisely, the procedure is initialised with a sample from with uniform normalised weights . Then suppose that we have a weighted sample from . First generate an equally weighted sample by resampling with replacement times to obtain (giving an approximate random sample from ). Note that each sample is independently drawn from . Next propagate each particle forward according to the Markov process model by sampling (giving an approximate random sample from ). Then for each of the new particles, compute a weight , and then a normalised weight . Again, from our understanding of importance resampling, it should be reasonably clear that is a consistent estimator of . It is much less clear, but nevertheless true that this estimator is also unbiased. The standard reference for this fact is Del Moral (2004), but this is a rather technical monograph. A much more accessible proof (for a very general particle filter) is given in Pitt et al (2011). It should therefore be clear that if one is interested in developing MCMC algorithms for state space models, one can use a pseudo-marginal MCMC scheme, substituting in from a bootstrap particle filter in place of . This turns out to be a simple special case of the particle marginal Metropolis-Hastings (PMMH) algorithm described in Andreiu et al (2010). However, the PMMH algorithm in fact has the full joint posterior as its target. I will explain the PMMH algorithm in a subsequent post.